On the night of September 15, 1956, seven-year-old Wayne Mallette, was brutally murdered on the grounds of the Canadian National Exhibition in Toronto. The chief suspect was a “boy on a bicycle” seen pedalling away from the CNE. Investigators zeroed on 14-year-old Ronald Moffatt, a former CNE employee who had the poor timing to run away from home shortly after the murder. Moffatt was located, arrested and interrogated. He eventually confessed and was convicted. The problem was, Moffatt couldn’t ride a bike and didn’t commit the crime. The real killer abused and murdered two more children, using his bike as a lure. A shocking true story, about a coerced confession, fumbled police investigation, a miscarriage of justice, and the star lawyer who fought to free Moffatt from custody. The Boy on the Bicycle is based on police files, interviews, original newspaper coverage, reports, books and documentaries. A compelling story of 14-year-old Ronald Moffatt who was wrongly charged and convicted of murdering seven-year-old Wayne Mallette in 1956 Toronto. Nate Hendley weaves facts and narrative to cover all bases –flawed police procedure, the legal system, the hidden psyche of the real killer and Moffatt’s story of his childhood before and his terror during and after his ordeal. 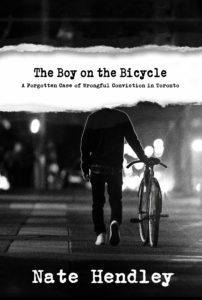 The Boy on the Bicycle is an exceptional read and serves as a unique time capsule of the times and mores of post-WWII Toronto when murders were rare and sexual predators were practically unheard of. While Ronald Moffatt remains uncompensated for his wrongful conviction, it was Mr. Hendley’s wish to finally tell Ron’s story after these many years, which he has done in a direct, yet compassionate manner. Five stars! The amazing story of a 62-year-old wrongful conviction is revealed in a riveting new book, The Boy on the Bicycle, by Nate Hendley, a seasoned true-crime writer.